As much as we love to enjoy artisanal cheeses on their own merits, with no other flavors to compete with their naturally robust flavor profiles, it can also be quite fun to cook with farmhouse, high quality cheeses. If you think your Sheppard’s Pie recipe can’t be topped using mass produced cheddars, wait until you try it with a handmade aged English farmhouse produced by a cheesemaker that has his own small herd of 45 cows, all of which have names. Alice Waters, owner of Chez Panisse, the wonderfully innovative restaurant in Berkeley known for its use of fine local produce, created this easy, elegant pasta. 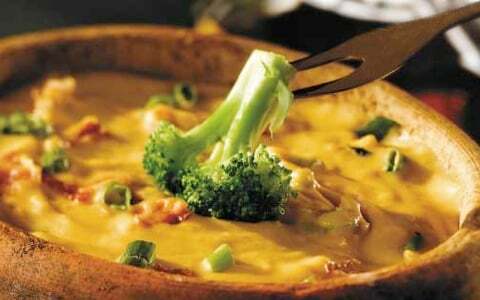 Very rich, it is perfect as a first course followed by roasted meat or fish with a cream less sauce. The exact proportions of Gorgonzola and Fontina, she explains, vary with the strength of the Gorgonzola. Look for one that is soft, creamy and full flavored. Grilled or broiled peaches, nectarines and pears. 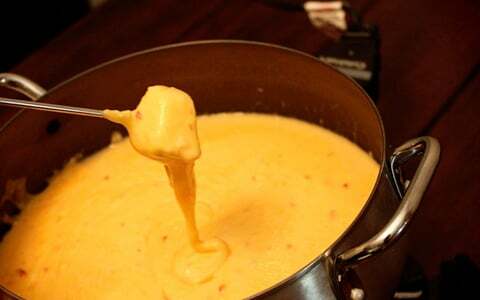 In a small-size saucepan, heat mascarpone cheese over low heat, stirring constantly, until melted. Stir in sugar, amaretto and orange extract and heat 1 to 2 minutes. 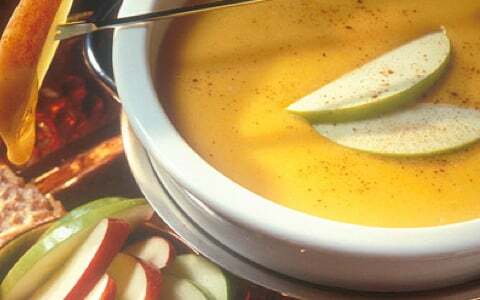 Transfer to a ceramic fondue pot and keep warm over a fondue burner. Sprinkle with cinnamon and nutmeg. 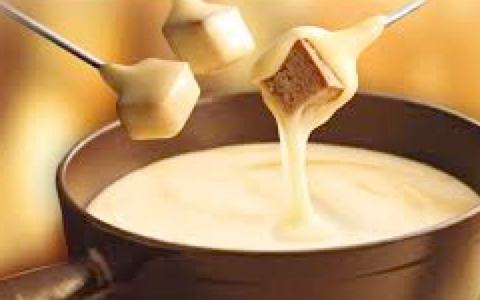 The fondue may be served in the pot or individual warmed ramekins. Serve with grilled or broiled fruit. Preheat grill or broiler. Cut fruit in halves and remove pits. Brush lightly with a little melted butter. Grill fruit over medium-hot coals just until heated through, 2 to 3 minutes on each side. Don't allow fruit to get too soft. The fruit may also be broiled 3 to 4 minutes, turning once. Makes 6 servings. Puree berries in a food processor until smooth. Pour the puree into a strainer over a medium-size saucepan. Rub the puree through the strainer, discarding seeds. Add sugar to puree and heat until sugar is dissolved. Stir in mint. 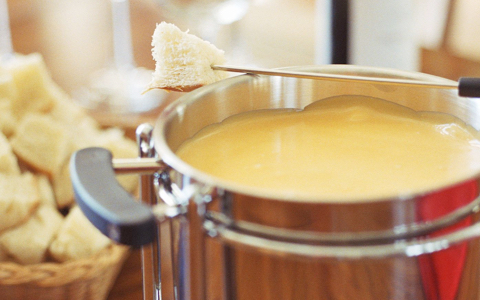 Transfer fondue to an enamel or ceramic fondue pot and keep warm over a fondue burner. 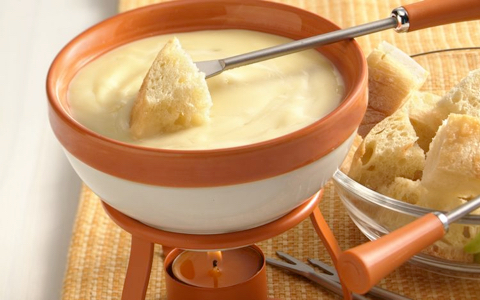 This fondue may be cooled and served at room temperature or chilled. Serve with bite-size pieces of Brie, Edam, Havarti, Port du Salut, ladyfingers and ginger cookies. Makes 8 servings. Preheat oven to 350° F. In a 9-inch square, nonstick baking dish evenly spread half of the apples and half of the Cheddar cheese over the bottom of the pan. Separate biscuit dough into individual biscuits; cut each biscuit into fourths. Arrange biscuit pieces, pointed ends up, over the apple and cheese mixture. Top evenly with remaining apples and cheese. In a small mixing bowl, combine brown sugar, apple pie spice, maple syrup and lightly beaten egg, mixing well. Stir in nuts. Spoon mixture evenly over biscuit pieces and apple mixture in pan. Bake for 35 to 45 minutes, or until nicely browned. Cool for 10 minutes. For maple drizzle, whisk cream cheese, confectioners’ sugar and maple syrup to create a consistency that allows easy drizzling. Additional maple syrup may be added if needed. Drizzle over warm coffee cake. Makes 9 servings. In a small mixing bowl, combine graham cracker crumbs, butter and honey and mix well. Place in a 9-inch spring form pan and spread evenly across the bottom. Refrigerate 30 minutes to chill. Preheat oven to 325 degrees F (165 degrees C). In a large electric mixer bowl, combine ricotta and eggs (beat in one at a time until incorporated). Add tablespoon of honey, vanilla and flour. Beat until smooth. Fold in lemon peel and almonds. Pour mixture into chilled crust and scatter pumpkin seeds on top. Bake for 1 hour or until just firm and lightly colored on top. Turn oven off, open door and leave pie inside to cool for 30 minutes. Remove pie from oven, refrigerate and chill for 2 hours to overnight before serving. Preheat oven to 200° C. Halve the butternut squash, scrape out the stringy flesh and seeds from the cavity and place in a baking pan and add an inch or so of water to the bottom of the pan. Place in the oven and roast for 45 - 50 minutes, until the edges are going slightly brown and the flesh is softening a bit. While the squash cooks, peel the potatoes, quarter them, and boil for 10 - 15 minutes until tender enough to mash. Drain well and transfer to a large mixing bowl. When the squash has cooled, scoop out the flesh and add to the potatoes, mash lightly and mix together, but do not over mix. Add the grated cheese, the red pepper, then grate the ginger into the mix and stir to blend thoroughly. Dust a baking sheet with some plain flour. Using floured hands, scoop up enough potato mixture to form a good sized ball about 2 inches in diameter, roll the balls in flour and place 2 inches apart on the baking sheet then flatten the balls slightly with the bottom of a glass. They should be about 3 inches across and 1/2 inch thick. Continue making these until all the mixture is used up. Melt the butter in a heavy bottomed skillet over a medium flame. Cooking in batches, gently slip the cookies into the pan and fry for about 3 - 5 minutes per side, until slightly golden and heated through. Keep them warm on a baking sheet in the oven until they are all cooked. Heat the oven to 250° F. Split the ladyfingers and spread them in a single layer on a baking sheet. Bake for about 5 minutes a side until crisp and light brown. Set aside. Beat the egg yolks and sugar together on high speed until very thick and pale yellow, about 5 minutes. Add the Mascarpone and triple sec and beat until smooth. Have ready a serving platter about 6 x 16 inches or one that half the ladyfingers will almost completely cover in a single layer. Put the coffee in a bowl. Dip the ladyfinger bottoms briefly into the coffee so they soak up some coffee but do not become soggy. Arrange half the ladyfingers, bottoms down, on the platter. Spread half the Mascarpone mixture on top to cover the ladyfingers. Sprinkle half the chocolate and almonds over the Mascarpone. Top with the remaining ladyfingers, dipped side down, the Mascarpone, chocolate and almonds. Cover loosely with foil and refrigerate five hours or overnight.